For other types of lightbulb mounts and sockets, see Lightbulb sockets. A metal halide lamp with a bipin cap. A bipin or bi-pin, (sometimes referred to as two-pin, bipin cap or bipin socket), is a standard from the IEC for lamp fittings. These are used on many small incandescent light bulbs (especially halogen lamps), and for starters on some types of fluorescent lights as well. Some lamps have pins placed closer together, preventing them from being interchanged with bulbs that are too high power, which may cause excessive heat and possibly fire. These are sometimes called "mini-bipin". Some of these, particularly in automotive lighting, have the pins bent back onto the sides of the base of the bulb, this is instead called a wedge base or socket. The bi-pin base was invented by Reginald Fessenden for the 1893 World's Fair in Chicago. After Westinghouse won the contract to wire and illuminate the first electrified fair with AC instead of archrival Thomas Edison's DC, Edison and his General Electric company refused to allow his patented Edison screw-base bulbs to be used. Westinghouse overcame this by inventing the bi-pin base for use at the fair. 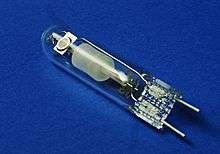 G9 IEC 60061-1 (7004-129) 9.0 mm Halogen 120 V (US) / 230 V (EU), also used for LED lamps. GU10 10 mm Twist-lock 120/230-volt MR16 halogen lighting of 35/50 watt, since the mid-2000s. Also used for compact fluorescents or LED lamps. GZ10 10 mm Twist-lock 120/230-volt MR16 halogen lighting of 35/50 watt, differs from GU10 by use of a dichroic reflector. GZ10 fixtures can also use GU10 bulbs, but not vice versa. The suffix after the G indicates the pin spread; the G dates to the use of Glass for the original bulbs. GU usually also indicates that the lamp provides a mechanism for physical support by the luminaire: in some cases, each pin has two diameters, being larger near the ends, in order to twist-lock into position in the socket (the transition between the two diameters is a right-angle step rather than a taper); in others, the base of the lamp has a groove which can be held by a spring or clip. A lowercase "q" at the end of the designation indicates that it is a quad-pin base, with two bi-pin pairs. These are used with compact fluorescent tubes that plug into a light fixture that has a permanent ballast. There are also double-ended tubes (both halogen and fluorescent) with one pin at each end, as well as high-output fluorescents with recessed or shrouded contacts, which are not covered here. ↑ "index". Osram.com. 2012-03-09. Archived from the original on April 29, 2011. Retrieved 2012-04-25. Wikimedia Commons has media related to Bipin.